This is it, people. Election ’08 happens today. After you’re done voting, check out these art-related events around the city. 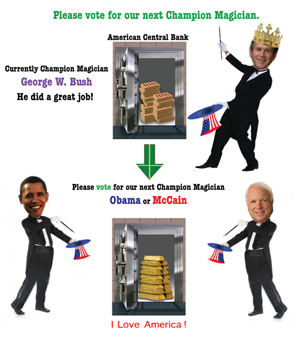 Beginning at noon, Chin Chih Yang, whose roving street art project 2050 Dumbo was a highlight of this year’s Art Under the Bridge Festival, kicks off a new performance called America is Looking for a New Champion Magician: Obama or McCain? The event starts at Wall Street & Broadway and “walks” uptown. More info at 123 Soho. If your idea of democracy inherently includes scantily-clad dancing, then Pratt Manhattan Gallery is the place to be tonight. Visit “Party Headquarters” starting at 7 pm for burlesque dance performances, art and electoral college action. In Brooklyn, 3rd Ward is hosting an “After Work Election Hoedown” from 6 pm “till the country turns blue.” There will be food, drinks, DJs and live screen-printing of Obama t-shirts. You probably don’t want to show up here with a McCain stencil. 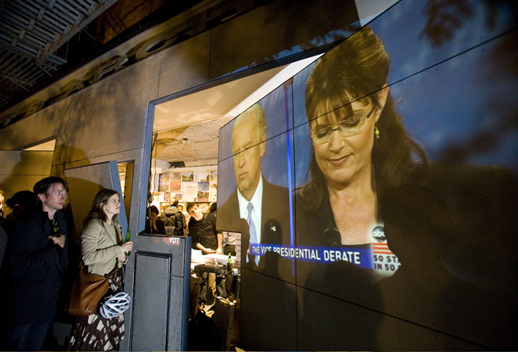 For the truly politically obsessed, Storefront for Art and Architecture is holding “an all-night election vigil,” complete with “large-screen CNN projection, 5 cable news channels, blogging stations and wi-fi for blog reading (and writing).” The event begins at 6 pm and guests are encouraged to bring their own food and sleeping bag. Coffee and croissants will be served the next morning at 7 am.